What’s Next: I will continue to serve Durham Public Schools as assistant principal of Fayetteville Street Elementary. I chose education because I believe that knowledge is the basis of all power. You can accomplish anything you set your mind to — you just need educate yourself! A professor also once told me that a teacher stands between a child and their dreams. I love the fact that I am a part of a child’s history, and I aim to to push them towards all of their dreams. 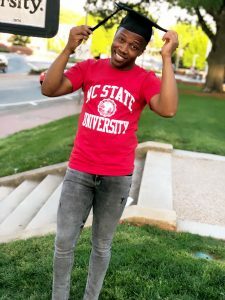 How did the NC State College of Education impact you? The College of Education’s Northeast Leadership Academy and Durham Principal Leadership Academy programs pulled out the leader in me that had always laid dormant. This program pulled me so far out of my comfort zone that, looking back now, I know I could never go back to the person I was before. I now walk into school buildings energized, prepared and equipped. Not only did the programs prepare the professional in me, but they also deeply developed the person I am as well. I am better because of this experience. What do you hope to accomplish in your field after graduation? I hope to create lasting and sustainable change, including a school environment that enables kids to have fun in the classroom again. I want to foster a school environment that makes kids beg their parents to go to school. I want to be creative, innovative and inspiring, and I want to push everyone I encounter to their greatest potential! I’d also love to one day become a superintendent and college professor to equip future leaders. What advice do you have for others considering education? Let your “why” direct your path to becoming an educator! Remember that who you will impact as an educator is more than a test score, socioeconomic status or stereotype — it’s a life that in some way you will alter forever!